To counter age-related decline in cognitive abilities, interventions such as working memory trainings have shown some promising results in old age. Yet, findings are mixed and there is enormous interindividual variability in training and transfer effects. Thus, it is still an open question which person-specific factors may moderate training and transfer effects in working memory interventions in older adults. The present study investigated this issue in the context of an established verbal working memory training. Eighty-eight participants (age range 60–82 years) performed either four sessions of the Borella et al. (Psychology and Aging 25(4):767–778, 2010) working memory training or of a visual search training as active control condition or belonged to a passive control group. Before and after the training, participants performed a test battery to assess different cognitive abilities and everyday competence. Furthermore, we included questionnaires on personality factors and intrinsic motivation as possible covariates. The training group showed a substantial training gain in the working memory criterion task that was not found in the active control group. Furthermore, only participants of the working memory training showed also near transfer to another working memory task. No far transfer effects including everyday competence emerged. In terms of possible moderators, age and crystallized intelligence influenced the training and transfer gain in the training group. In conclusion, our results showed that working memory can be improved in older adults and improvements transfer to a non-trained working memory task. However, person-specific factors have to be considered to understand who benefits from the training and why. MK acknowledges the support from the Swiss National Science Foundation (SNSF). We thank Thomas Redick (Purdue University) for providing us the task for our active control training group. All participants signed an informed consent prior to study participation. The study was approved by the local ethics committee of the University of Geneva. Au, J., Sheehan, E., Tsai, N., Duncan, G. J., Buschkuehl, M., & Jaeggi, S. M. (2015). Improving fluid intelligence with training on working memory: a meta-analysis. Psychonomic Bulletin & Review, 22, 366–377. https://doi.org/10.3758/s13423-014-0699-x. Borella, E., Carbone, E., Pastore, M., De Beni, R., & Carretti, B. (2017). Working memory training for healthy older adults: the role of individual characteristics in explaining short- and long-term gains. Frontiers in Human Neuroscience, 11(99). https://doi.org/10.3389/fnhum.2017.00099. Brehmer, Y., Westerberg, H., & Backman, L. (2012). Working-memory training in younger and older adults: training gains, transfer, and maintenance. Frontiers in Human Neuroscience, 6(63). https://doi.org/10.3389/Fnhum.2012.00063. Brom, S. S., Schnitzspahn, K. M., Melzer, M., Hagner, F., Bernhard, A., & Kliegel, M. (2014). Fluid mechanics moderate the effect of implementation intentions on a health prospective memory task in older adults. European Journal of Ageing, 11(1), 89–98. https://doi.org/10.1007/s10433-013-0288-2. Karbach, J., & Verhaeghen, P. (2014). Making working memory work: a meta-analysis of executive-control and working memory training in older adults. Psychological Science. https://doi.org/10.1177/0956797614548725. Kueider, A. M., Parisi, J. M., Gross, A. L., & Rebok, G. W. (2012). Computerized cognitive training with older adults: a systematic review. Plos One, 7(7), e40588. https://doi.org/10.1371/journal.pone.0040588. Lampit, A., Hallock, H., & Valenzuela, M. (2014). 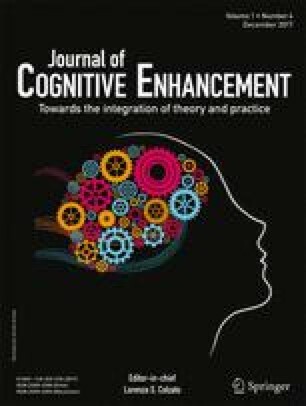 Computerized cognitive training in cognitively healthy older adults: a systematic review and meta-analysis of effect modifiers. Plos Medicine, 11(11), e1001756. https://doi.org/10.1371/journal.pmed.1001756. Melby-Lervag, M., & Hulme, C. (2016). There is no convincing evidence that working memory training is effective: a reply to Au et al. (2014) and Karbach and Verhaeghen (2014). Psychonomic Bulletin & Review, 23(1), 324-330. https://doi.org/10.3758/s13423-015-0862-z. Redick, T. S., Shipstead, Z., Harrison, T. L., Hicks, K. L., Fried, D. E., Hambrick, D. Z., … Engle, R. (2013). No evidence of intelligence improvement after working memory training: a randomized, placebo-controlled study. Journal of Experimental Psychology: General, 142(2), 359–379. https://doi.org/10.1037/a0029082. Rose, N. S., Rendell, P. G., Hering, A., Kliegel, M., Bidelman, G., & Craik, F. I. M. (2015). Cognitive and neural plasticity in older adults’ prospective memory following training with the Virtual Week computer game. Frontiers in Human Neuroscience, 9(592). https://doi.org/10.3389/fnhum.2015.00592. Soveri, A., Antfolk, J., Karlsson, L., Salo, B., & Laine, M. (2017). Working memory training revisited: a multi-level meta-analysis of n-back training studies. Psychonomic Bulletin & Review, 24(4), 1077–1096. https://doi.org/10.3758/s13423-016-1217-0.